In 1964, Ainslie school became the first school in Australia to have a sister school in Japan, Nezu Elementary School in Tokyo. This link was strongly fostered by the former Principal, Mr Harold Butler and by Mr C S Daley, who acted as the first official visitor to Nezu in 1965. Ainslie School was visited by the Principal of Nezu school. When Mr Butler took over as Principal, he made a special point of introducing this cultural and educational contact with Japanese teachers and students. During the years, both schools exchanged greetings, information, school work and they presented each other's libraries with reference books and pictures. In 1966/7 Ainslie School led the way as the first primary school in the ACT to offer Japanese classes. Some of these early students went on to study Japanese at a tertiary level. In March 1967, the Honourable Doug Anthony, then Minister of the Interior, planted a Gingko tree in the school grounds. Later, a grove of 24 cherry trees and another gingko tree were planted. The Sakura are still there but the Gingko trees are gone. Although the Principals sometimes had difficulties in finding Japanese teachers, Mr Jim Mitchell, Principal from 1979 to 1993, asked the Australia-Japan Society for assistance. Teachers were provided by the society throughout the 1980s. The school was also helpful in providing families willing to host visiting Japanese students. Mr Barry Jarman and Kaigyo Miyazaki, the Abbot of the ancient Buddist Byakugo-ji Temple, both of the Japan-Australia Society, suggested a sister school relationship between Tsubai, the oldest elementary (primary) school in Nara (1872), and Ainslie, the oldest primary school in Canberra (1927). Nara had been a capital city, Canberra is a capital city and both schools had famous, former students, including the Mayor of Nara. In 1988, Mr Motokazu Toyoda, the Principal of Tsubai, and Mr Mitchell exchanged letters and agreed to an interchange of friendship between the two schools. In 1990, Ainslie School took a delegation of 42 students, teachers and parents to Nara. This was the first overseas excursion undertaken by a primary school in the ACT. Since 1970, Ainslie School has been visited by many visitors from Japan. Since 1980, these visitors have mostly come from Nara. They have included the Mayor of Nara, the Deputy Mayor of Nara, the Matsubokkri Children's Choir, teachers from Tsubai, Nara Education officials, the Noh theatre actors and many college students. The Canberra Nara sister-city relationship was established on 26 October 1993. 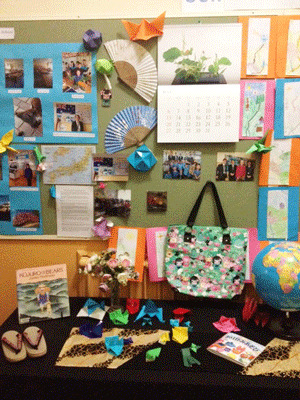 In recent years, the Ainslie School community has welcomed a Japanese teaching assistant from Kagoshima University. These assistants have been hosted by several school families. It has been very advantageous to have these assistants working in the school community. In 2013 the Principal, Mrs Kate Chapman, emailed the Principal of Tsubai School, Bando Toshiyuki, to ask if she could visit Tsubai School on her next visit to Japan. This visit occurred on Friday, 10 January 2014. Mrs Chapman was accompanied by her husband, Mr Max Chapman. The Principals exchanged information about each other's school and both expressed an interest in maintaining the sister school relationship. The assistant English teacher, Emi, is keen to have students communicate via the internet. Mr and Mrs Chapman took a tour of the school. 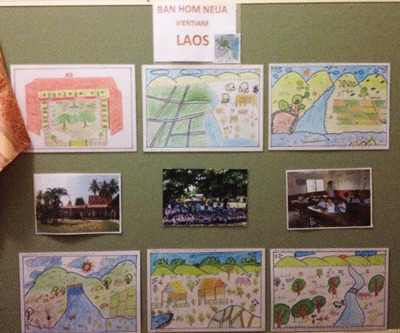 In 2012, Ainslie School was contacted by the then Ambassador to Laos, Lynda Worthaisong, who asked if we would be interested in establishing a relationship with a school in Vientiane, Ban Hom Neua. We agreed and received some photos and drawings from the school which reflected the story our then Prime Minister, the Hon Julia Gillard MP, had told them, Possum Magic, when she had visited during the year. Shortly after our correspondence, we hosted a delegation of education officials from Laos, including the Lao Minister for Education. They were particularly interested in asking about how we develop and support teachers. 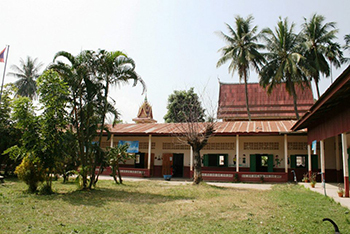 In 2013, we were contacted by the embassy in Laos to ask if we would be interested in raising some funds for the school, which needed $300 to pay to repaint the exterior. A pyjama day raised $1, 070 which was sent to the school. In 2014, pictures and books were sent to Ban Hom Neua with an Australian delegation led by the Foreign Minister, the Hon Julie Bishop MP.